A few weeks ago I had the privilege of reviewing portfolios at Colorado Photographic Arts Center for Month of Photography in Denver. I spend a lot of time at my computer writing about photography and events like these are a wonderful way to make personal connections with the people who make up the photography community. The photographers I met with presented completed and in-progress portfolios in a wide range of genres and processes. Most of the photographers I met with were eager to have discussions about how to develop their works-in-progress, and approaches to marketing completed bodies of work. Although 20 minutes isn’t a lot of time to fully delve into the complexities of art-making and the art market, I hope that I was able to provide helpful critique and feedback. In addition to the one-on-one reviews, CPAC organized a portfolio walk on Saturday evening where each photographer displayed their work to the public and made themselves available for questions. Here are a few portfolios that I enjoyed. Sparsely scattered throughout remote mountainous regions from Colorado to California there exist stands of several-thousand-year-old Bristlecone Pines. One particular stand lives near me in the Colorado mountains. For more than 15 years I have visited these trees, as one would an ancient temple or sage, and I consider the myriad global changes through which they have stood. For me, they embody temporality and transcendence held in balance. They prosper in some of this planet’s harshest environments. Rising from thin, arid soil along an 11,200-foot tree line, they endure fierce perpetual winds, withstand long periods of drought, and year-round temperatures hovering near to well-below freezing. I am awed by their beauty, and moved by their strength and resilience against time, wind, altitude…everything but us. These ancient trees, some alive since before the Roman Empire, are at last, dying. Their slow demise is due to climate change and the introduction of invasive species against which they have no defense. While struggling to convey how I view these trees, I happened upon a case of expired black and white Polaroid Type 665 film. Discontinued in 2007, the film was itself a vestige of a bygone era, and decades beyond its expiration date. 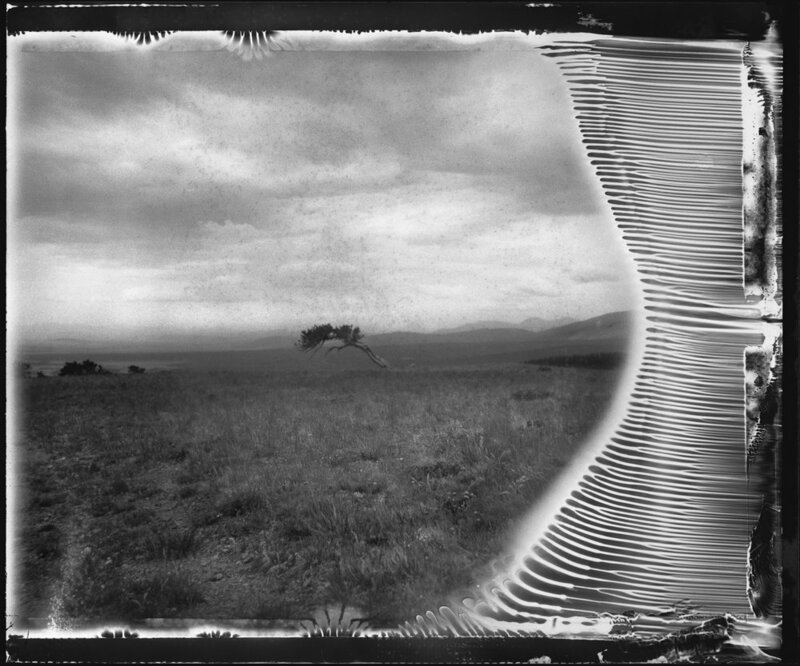 The film’s imperfections and truncated tonal range, imposed by time and climate, created visually meaningful implications. 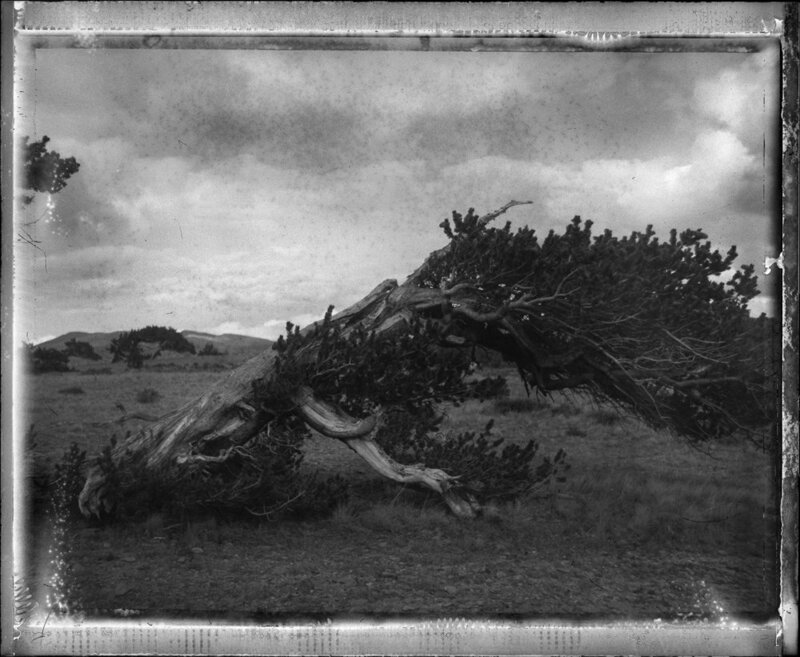 Juxtaposed with the unique Bristlecone Pine forms, the resulting images underscore the steadfast value of the past, and a sense of unease as we move into a future where human endeavors supersede adopting a balanced place in the natural world. But in recent years, some of the most compelling “new” landscapes have been explicitly defined by the economics of their development. These places are not discovered, claimed, nor even cultivated as in centuries past. They are now designed, with bold and deliberate physical attributes, whose aesthetics are driven by a desire to appeal to a customer—the homeowner or investor who will buy the newly developed land. namesake is my response to the ongoing American crisis of racial inequality and violence. White privilege has a long history; it can be seen in historic lynching photographs that were shared as postcards or saved as souvenirs. This installation uses three historic lynching photographs, coupled with facial recognition technology that searches to recognize members of the lynch mobs—interrupting the impunity bestowed on the participants and spectators. A screen in the installation plays YouTube videos made in response to former NFL quarterback Colin Kaepernick’s recent protests against police brutality in the United States. Using visual media and technology, these white performers create a message that is intended to evoke fear without concern of consequence. Through making this work, I started to contemplate the privilege that has been granted to me by the white color of my skin and its physical likeness to that of the lynchers. Understanding that my silence contributes to complacency, I started to ask myself, when does the crowd become a mob and when does an individual get lost in it? We are not defined by our fears, but I believe they cut to the core of our being in a way that most other feelings do not. I spent several years in a bad relationship followed by prolonged stalking by my ex that even extended to other countries. I had to get the police involved on numerous occasions and my mental and emotional life was a complete disaster. Yet I kept it hidden. It took all my strength to pass as a functional, reliable person even as I felt like a hollow eggshell, ready to crumble and implode at any moment. I was too embarrassed to share my situation with anyone, afraid of what they would think, afraid of losing work. It made me wonder what others were hiding, what kept them awake, what they were afraid to tell anyone for fear of repercussions. I knew from experience how well a facade can be maintained, that we cannot trust what we see. Our fears are held closely, and the experience of them is intensely personal and often isolating. I’ve asked complete strangers to share their fears and be photographed, an act of courage perhaps made easier because of they did not know me. Our collaborations offered a chance to relieve themselves of isolation, if only for awhile. This series examines the dichotomy between our who we are and who we appear to be, of how little we know of those around us and what they carry. I am terrified that my genetics will someday be my future. Afraid of the voices in my head or that those bits of paranoia aren’t acceptable and in fact the result of a disorder. My grandmother was schizophrenic and killed herself when I was six months old. I’ve lived with her shadow. My dad always warning “that stuff skips a generation,” and it’s terrified me since childhood as I’ve struggled through my own bouts of mental health issues. Aside from losing my parents or having something terrible happen to my children, deep down I’m afraid of two things: not truly living my life, and opening my heart to true intimacy. I’m intensely afraid of failure, to the point of paralysis in my creative output. I’m secretly afraid I’ll never harness any of my potential. I crave connection to a community of artists, but have overwhelming thoughts of never becoming one of them.